Cecil Gaines (Forest Whitaker) grew up as a slave and a houseboy in the south before heading north to become a butler, eventually lucking into a job as a butler in the White House, starting with the Eisenhower (Robin Williams) administration and ending with the Reagan (Alan Rickman) administration. Those around him experience the highs and lows of the Civil Rights movement, with his oldest son growing from a Martin Luther King, Jr. acolyte to a Black Panther while the trauma causes his stay-at-home wife (Oprah Winfrey) to consistently struggle with alcoholism. As for Cecil, though, he mostly just serves tea and cookies to the various residents and visitors to the White House. The story is loosely based on the life of Eugene Allen. 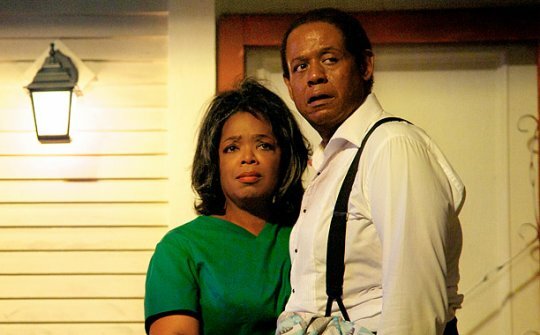 It takes all of one minute for Lee Daniels’ The Butler to declare its purpose. There is a rather brief opening shot of Cecil Gaines (Forest Whitaker) as an older man awaiting an appointment at the White House, thus establishing the film’s framing device i.e., that Gaines will narrate the events from his life from that chair. After that, we smash-cut to a shot of two dead African American men hanging from a light pole in the middle of town in 1920s Macon, Georgia. This shot occupies the entirety of the right-hand side of the frame while the left-hand side is populated with a quote from Martin Luther King, Jr., displayed in big, white text. There is nothing inherently wrong with this moment. However, it is in no way subtle, instead announcing The Butler as a big, important film about the plight of the African American in the United States in the 20th Century. That is a certainly noble endeavor, and its opening moments more tolerable if they actually followed through on their promise. Unfortunately, the film ends up coming off as a hodgepodge of questionable casting choices, great performances rubbing against bad ones, bizarre choices for time jumps, and a sense that the story being told here would be better served by a mini-series than an ultra-crammed theatrical film. Forest Whitaker is, as would be expected, fantastic as Cecil as is David Oyelowo as his oldest son Louis. Whitaker has to play a largely static character who simply wants to provide for his family with no thought to politics or the larger advancement of his own race, which at times places his character in a comparatively unsympathetic light. However, Whitaker pulls it off. Oyelowo has the showier role, acting as the Jenny to Whitaker’s Forrest Gump (i.e., the person who is actively involved with the various activist movements from the history of the time). Luckily, Oyelowo plays him with a steadfast determination and dignity that makes him ceaselessly captivating, even in the moments when the film appears to be judging his choices. Cuba Gooding, Jr. and Lenny Kravitz provide levity as two fellow butlers at the White House as does scene-stealing Elijah Kelley as Cecil’s youngest song Charlie. 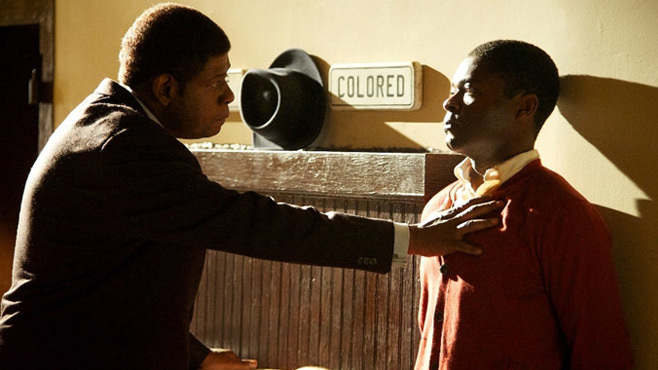 Forest Whitaker and David Oyelowo as father and son. But then there’s Oprah Winfrey. I appear to be in the minority on this one, but she is a mixed bag here. There are moments of genuine intentional humor or drama from her (a late conversation she has about the name “Shaquiqa” is hilarious). However, there are also moments of horribly hammy acting displaying her limits as a performer, highlighted by being placed in scenes featuring superior performances from Whitaker and Oyelowo. She has a big dramatic monologue involving her constantly re-applying lipstick while looking in a mirror as her husband tries to ignore her that is particularly embarrassing in both Lee Daniels’ directing, lighting, and her performing. Shots like these with Terrence Howard and Oprah Winfrey very much so remind you that this is a film from the same guy who directed Precious. Then there are the Presidents. Oh, the Presidents. There’s Robin Williams as Eisenhower, John Cusack as Nixon, James Marsden as Kennedy, Liev Schrieber as a caricature, comic relief version of Johnson (then again, that’s kind of what Johnson was really like), and Alan Rickman as Reagan. Gerald Ford goes completely unmentioned and ignored while Jimmy Carter only shows up in real, archival footage seen briefly in a quick montage to bridge the sizable gap from 1972 to 1986. Not all of these performances are actually bad (well, Cusack’s probably is). However, each and every one of the actors completely undercuts the film by being far too recognizable, and for the most part, looking and sounding nothing like the historical figures they’ve been cast to play. 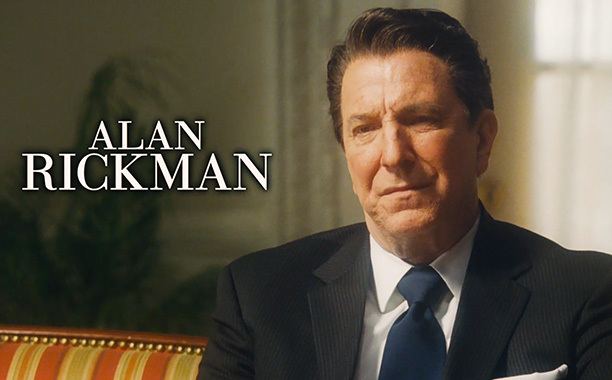 Except for maybe Alan Rickman, who both looks and sounds the most like his President, out of everyone in the cast. The First Ladies, Minka Kelley as Jackie Kennedy and Jane Fonda as Nancy Reagan, barely register. Screenwriter Danny Strong and director Lee Daniels were ambitious in trying to take on a story which begins with the protagonist as a kid in the 1920s and then routinely jumps to important moments throughout the 1950s and 1960s before brief stops in the 70s, 80s, and 2000s. Their shortcut around it is to use historical footage to bridge the gaps between historical eras and to utterly and completely skip the eras in which nothing important on the topic of race happened (from their point of view at least), thus the exclusion of Gerald Ford and Jimmy Carter. It works about as well as it could, but it forces them to rush certain things (e.g., Louis’ girlfriend suddenly becomes unbearable overnight, largely because of a time jump in which 4 or 5 years have passed), and has a horribly lazy habit of foreshadowing. Daniels’ directing is particularly vexing. There are some incredibly heavy-handed moments, such as an attempt to juxtapose Cecil and the butler’s serving white people in the White House while his son and friends stage a sit-in at a restaurant in the south. Plus, from a technical standpoint, there are also plenty of rather amateurish moments, particularly the poorly executed usage of slow-motion during a sequence involving the Klu Klux Klan attacking a busload of freedom riders in Alabama. However, then there’s a moment of utter mastery like when they cut back and forth between a training session the students conducted before the fact to the actual event of the sit-in. *LIGHT SPOILER WARNING* The conclusion of The Butler features a sequence impossibly similar to that of the absolute final moment of Steven Spielberg’s Lincoln, just change out Daniel Day-Lewis for Forest Whitaker (and, no, I’m not talking about the assassination part of the ending of Lincoln..think after that). However, as in-arguably important as Lincoln was to African-Americans that is still a white man made the hero and savior to the African-American, a common occurrence in American films which deal with matters of race. Even 2011’s The Help can be viewed as the story of how a white person helped solve a black person or people’s problems. As such, it is fantastic to have Cecil and Louis Gaines presented in the form of The Butler as new icons of African-American cinema, and Whitaker and Oyelowo’s performances are up to the task. It’s the rest of the film that isn’t, but the fact that they at least tried and are enjoying box office success with it is a good thing.